Promoted Millwall made a perfect start to life back in the Championship with a comprehensive victory to spoil David James's debut for Bristol City. Goals from Darren Ward just before half-time and second half strikes from Danny Schofield and Paul Robinson secured victory for the Lions. Darren Carter marred the visitors' day by earning a second yellow and subsequent red card in the 64th minute. City also ended with 10 men when Damion Stewart saw a second yellow late on. Stewart was one of three debutants - along with Nicky Hunt and England keeper James - in Steve Coppell's City side, but it was the injured absentees that arguably proved costly for the home side. Last season's top scorer Nicky Maynard was one of seven first-team players missing and the Robins offered little to hurt a Millwall side on a high after last season's promotion via the play-offs. The closest City came to a goal was when Cole Skuse's 12-yard shot struck a post after 56 minutes. By that point Millwall were already two goals ahead through Ward's simple finish, after Lisbie had hit a post, and Schofield's curling right-foot effort. Robinson put the game beyond the home side on the hour, when he was on hand to apply the finish after Lisbie had again hit the woodwork - this time the bar with a header. Four minutes later Carter was shown his second yellow card and then red for a foul on Albert Adomah. Despite their numerical disadvantage, the visitors tested James further, but the keeper - who signed from relegated Portsmouth - was able to keep out James Henry's close-range header. Carter was joined on the sidelines by City's Stewart in injury time, when his foul on Lisbie was deemed to be worthy of his second booking of the game. 90:00+1:43 Scott Barron restarts play with the free kick. 90:00+1:43 Substitution Marc Laird joins the action as a substitute, replacing Liam Trotter. 90:00+1:43 Sent off Damion Stewart receives a red card. 90:00+1:36 Free kick awarded for a foul by Damion Stewart on Kevin Lisbie. 90:00+0:14 Danny Schofield produces a drilled right-footed shot from 25 yards. Save made by David James. 90:00 The referee ends the match. 89:36 Gavin Williams challenges Paul Robinson unfairly and gives away a free kick. Direct free kick taken by David Forde. 89:23 Goal kick taken short by David James (Bristol City). 88:07 Attacking throw-in by David Clarkson (Bristol City). 87:52 Marlon Jackson takes a shot. Save made by David Forde. 85:58 Defending throw-in by Alan Dunne (Millwall). 85:14 Goal kick taken long by David Forde (Millwall). 84:21 Goal kick taken long by David Forde (Millwall). 83:24 Goal kick taken long by David Forde (Millwall). 83:24 Substitution Neil Harris joins the action as a substitute, replacing Steve Morison. 82:24 Nicky Hunt challenges Kevin Lisbie unfairly and gives away a free kick. Scott Barron takes the free kick. 81:19 Inswinging corner taken by Jamie McAllister from the right by-line played to the near post, Steve Morison makes a clearance. 80:56 Defending throw-in by Jamie McAllister (Bristol City). 80:12 Substitution Chris Hackett replaces James Henry. 80:12 Substitution Ivan Sproule goes off and Gavin Williams comes on. 79:34 Albert Adomah produces a drilled left-footed shot from 20 yards. Save by David Forde. 74:03 Liam Fontaine takes a shot. David Forde makes a save. 73:31 Attacking throw-in by Ivan Sproule (Bristol City). 72:50 Defending throw-in by Alan Dunne (Millwall). 71:37 Defending throw-in by Jamie McAllister (Bristol City). 70:58 The referee blows for offside. David Forde takes the indirect free kick. 69:56 Goal kick taken long by David James (Bristol City). 69:12 Outswinging corner taken by James Henry, Headed effort from deep inside the area by Kevin Lisbie misses to the left of the goal. 67:45 Direct free kick taken by Paul Robinson. 67:45 Booking Damion Stewart goes into the referee's book for unsporting behaviour. 67:29 Foul by Damion Stewart on Danny Schofield, free kick awarded. 66:53 Defending throw-in by Alan Dunne (Millwall). 66:39 Goal kick taken long by David Forde (Millwall). Correction - 66:03 Substitution Sam Vokes leaves the field to be replaced by Marlon Jackson. 66:03 Substitution Bristol City substitution: Ivan Sproule replaced by Marlon Jackson (injury). 63:36 Cole Skuse takes the direct free kick. The ball is crossed by Jamie McAllister. 63:36 Sent off Darren Carter dismissed for second bookable offence. 63:15 Free kick awarded for a foul by Darren Carter on Albert Adomah. 63:02 Steve Morison takes a shot. Liam Fontaine gets a block in. 62:59 Attacking throw-in by Scott Barron (Millwall). 62:24 Liam Trotter has an effort at goal from outside the penalty box missing to the wide right of the target. 61:38 James Henry takes a shot. Save by David James. James Henry decides to take the corner short. 61:31 Defending throw-in by Scott Barron (Millwall). 60:41 Defending throw-in by Scott Barron (Millwall). 60:38 Defending throw-in by Scott Barron (Millwall). 59:29 Assist by Kevin Lisbie. 59:29 GOAL - Paul Robinson:Bristol City 0 - 3 Millwall Paul Robinson gets on the score sheet with a goal from inside the box to the bottom left corner of the goal. 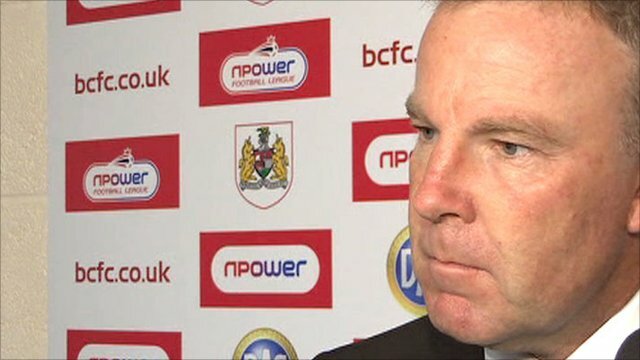 Bristol City 0-3 Millwall. 58:36 Scott Barron crosses the ball, Damion Stewart makes a clearance. James Henry takes a inswinging corner from the left by-line played to the near post, Kevin Lisbie takes a shot. 58:04 The ball is crossed by Cole Skuse, save by David Forde. 57:06 Jamie McAllister takes a inswinging corner. 56:19 Corner taken right-footed by James Henry from the right by-line, Header by Paul Robinson from deep inside the penalty area misses to the right of the target. 55:50 Cole Skuse produces a right-footed shot from inside the area and hits the post. Effort from deep inside the area by Cole Skuse misses to the right of the target. 55:34 Headed effort from inside the area by Steve Morison misses to the left of the goal. 54:38 Darren Carter takes a shot. Marvin Elliott gets a block in. James Henry decides to take the corner short. 54:12 Defending throw-in by Alan Dunne (Millwall). 53:02 Goal kick taken long by David James (Bristol City). 53:02 Substitution (Bristol City) makes a substitution, with Sam Vokes coming on for Jamal Campbell-Ryce. 53:02 James Henry has an effort from just inside the box that misses to the left of the goal. 51:41 Attacking throw-in by Alan Dunne (Millwall). 50:29 Jamal Campbell-Ryce takes a shot. Blocked by Darren Ward. Corner taken by Cole Skuse, Header from deep inside the area by Liam Fontaine goes over the bar. 50:14 Liam Fontaine takes a shot. Paul Robinson gets a block in. 49:54 Attacking throw-in by Nicky Hunt (Bristol City). 49:47 Attacking throw-in by Ivan Sproule (Bristol City). 49:34 Attacking throw-in by Nicky Hunt (Bristol City). 48:40 Defending throw-in by Scott Barron (Millwall). 47:33 Assist on the goal came from Steve Morison. 47:33 GOAL - Danny Schofield:Bristol City 0 - 2 Millwall Danny Schofield finds the back of the net with a goal from inside the penalty area to the bottom right corner of the goal. 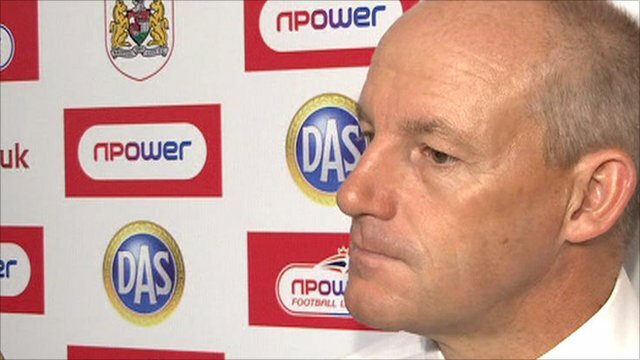 Bristol City 0-2 Millwall. 47:12 Goal kick taken long by David James (Bristol City). 47:01 Darren Carter has an effort at goal from outside the area which misses left. 46:09 Attacking throw-in by Scott Barron (Millwall). 45:52 David Clarkson takes a shot. Darren Ward gets a block in. 45:00+0:07 Defending throw-in by Scott Barron (Millwall). 44:53 Defending throw-in by Nicky Hunt (Bristol City). 44:35 Goal kick taken long by David James (Bristol City). 43:35 Ivan Sproule has an effort at goal from outside the box which goes wide right of the goal. 41:37 Assist on the goal came from Kevin Lisbie. 41:37 GOAL - Darren Ward:Bristol City 0 - 1 Millwall Goal scored by Darren Ward from close in to the top left corner of the goal. 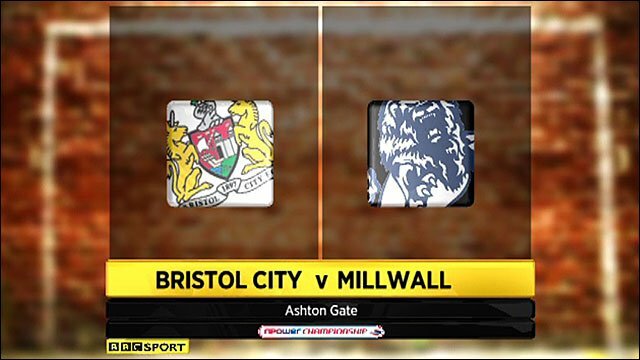 Bristol City 0-1 Millwall. 41:09 The ball is swung over by Liam Trotter, Damion Stewart makes a clearance. Inswinging corner taken right-footed by James Henry, Jamal Campbell-Ryce makes a clearance. 40:39 Defending throw-in by Damion Stewart (Bristol City). 40:00 Liam Fontaine concedes a free kick for a foul on Kevin Lisbie. David Forde takes the free kick. 39:47 Jamie McAllister delivers the ball, clearance made by Paul Robinson. 39:27 Defending throw-in by Nicky Hunt (Bristol City). 38:57 Defending throw-in by Scott Barron (Millwall). 38:38 Attacking throw-in by Nicky Hunt (Bristol City). 38:18 Goal kick taken long by David Forde (Millwall). 37:57 Long distance shot from Marvin Elliott misses to the left of the target. 37:44 Defending throw-in by Scott Barron (Millwall). 36:59 Defending throw-in by Alan Dunne (Millwall). 36:02 Darren Carter takes a shot. Nicky Hunt gets a block in. 35:28 Attacking throw-in by Steve Morison (Millwall). 34:33 Albert Adomah fouled by Alan Dunne, the ref awards a free kick. Cole Skuse delivers the ball from the free kick right-footed from left wing, Darren Ward manages to make a clearance. 33:59 Centre by James Henry. 33:51 Attacking throw-in by Kevin Lisbie (Millwall). 33:22 Defending throw-in by Alan Dunne (Millwall). 32:40 Foul by Jamie McAllister on Steve Morison, free kick awarded. James Henry crosses the ball from the free kick right-footed from right channel, Nicky Hunt manages to make a clearance. 32:02 Albert Adomah crosses the ball. 31:29 The ball is swung over by James Henry, save by David James. 30:34 Direct free kick taken by Jamie McAllister. 30:34 Booking Darren Carter is cautioned. 30:23 Darren Carter concedes a free kick for a foul on Liam Fontaine. 29:59 The offside flag is raised against David Clarkson. Alan Dunne restarts play with the free kick. 28:57 Unfair challenge on Ivan Sproule by Danny Schofield results in a free kick. Free kick crossed by Jamie McAllister, clearance made by Darren Ward. 27:30 Defending throw-in by Nicky Hunt (Bristol City). 26:55 Attacking throw-in by Alan Dunne (Millwall). 26:28 Attacking throw-in by Alan Dunne (Millwall). 25:44 James Henry has an effort at goal from outside the area missing to the wide right of the target. 25:31 James Henry delivers the ball, Jamie McAllister makes a clearance. 25:17 Foul by Marvin Elliott on Darren Carter, free kick awarded. James Henry takes the direct free kick. 24:21 Free kick awarded for an unfair challenge on Danny Schofield by David Clarkson. David Forde restarts play with the free kick. 24:11 Attacking throw-in by Ivan Sproule (Bristol City). 23:37 Kevin Lisbie gives away a free kick for an unfair challenge on Nicky Hunt. Direct free kick taken by Nicky Hunt. 22:52 Paul Robinson concedes a free kick for a foul on David Clarkson. Direct free kick taken by Jamie McAllister. 22:45 Defending throw-in by Jamie McAllister (Bristol City). 22:13 Attacking throw-in by Scott Barron (Millwall). 20:59 Centre by Darren Carter, Liam Fontaine manages to make a clearance. Corner taken by James Henry, Headed effort from deep inside the penalty area by Paul Robinson goes harmlessly over the crossbar. 20:55 Attacking throw-in by Alan Dunne (Millwall). 20:23 A cross is delivered by Albert Adomah. 18:32 Effort on goal by Danny Schofield from long range goes over the crossbar. 18:06 Defending throw-in by Nicky Hunt (Bristol City). 18:01 The ball is swung over by James Henry. 17:46 Attacking throw-in by Kevin Lisbie (Millwall). 16:36 Attacking throw-in by Kevin Lisbie (Millwall). 15:19 Jamie McAllister challenges Steve Morison unfairly and gives away a free kick. Direct free kick taken by David Forde. 15:05 Defending throw-in by Alan Dunne (Millwall). 14:33 Defending throw-in by Alan Dunne (Millwall). 14:11 Liam Trotter gives away a free kick for an unfair challenge on Jamal Campbell-Ryce. Cole Skuse restarts play with the free kick. 13:45 The ball is swung over by James Henry, Damion Stewart makes a clearance. 13:02 Marvin Elliott gives away a free kick for an unfair challenge on Darren Carter. Darren Ward restarts play with the free kick. 12:30 Goal kick taken long by David James (Bristol City). 11:38 Attacking throw-in by Nicky Hunt (Bristol City). 10:46 Defending throw-in by Scott Barron (Millwall). 10:25 Outswinging corner taken by Jamie McAllister. 10:09 Ivan Sproule takes a shot. Blocked by Danny Schofield. 9:51 Attacking throw-in by Jamie McAllister (Bristol City). 8:56 James Henry challenges Liam Fontaine unfairly and gives away a free kick. Jamie McAllister crosses the ball from the free kick left-footed from left wing, save made by David Forde. 8:28 Goal kick taken long by David James (Bristol City). 7:49 Corner taken right-footed by James Henry from the left by-line to the near post, Darren Ward produces a header from inside the area that goes over the crossbar. 7:02 Free kick awarded for a foul by Marvin Elliott on Alan Dunne. James Henry crosses the ball from the free kick right-footed from right wing, Nicky Hunt manages to make a clearance. 6:39 Defending throw-in by Jamie McAllister (Bristol City). 6:09 Free kick awarded for an unfair challenge on Kevin Lisbie by Liam Fontaine. Paul Robinson takes the free kick. 5:11 Darren Ward concedes a free kick for a foul on David Clarkson. The free kick is swung in right-footed by Cole Skuse, Paul Robinson manages to make a clearance. 4:56 Defending throw-in by Scott Barron (Millwall). 4:28 Attacking throw-in by Alan Dunne (Millwall). 4:06 Defending throw-in by Jamie McAllister (Bristol City). 2:57 Defending throw-in by Jamie McAllister (Bristol City). 2:19 Jamie McAllister sends in a cross, save by David Forde. Marvin Elliott gives away a free kick for an unfair challenge on David Forde. David Forde takes the free kick. 2:03 Corner from the left by-line taken by Jamie McAllister, clearance by Darren Ward. 1:01 Goal kick taken long by David Forde (Millwall). 0:44 Attacking throw-in by Nicky Hunt (Bristol City). 0:15 Foul by Jamal Campbell-Ryce on Liam Trotter, free kick awarded. Darren Carter takes the free kick.